Cricket is a quintessential English game that should be enjoyed on a pleasant summer’s afternoon, broken up by breaks for Earl Grey tea and cornered sandwiches. To a first time viewer the best way of describing Cricket is as a warped game of baseball, where everyone plays with much straighter arms and bats, whilst wearing a rather fetching pair of white pajamas. 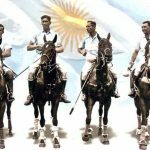 Imagine how different history would have been if this complicated game, rather than soccer, had become Argentina’s national sport. Assuming he proved equally adept with his hands when dealing with a smaller, harder ball, Argentina could be worshiping Diego Maradona’s right palm for success in an entirely different World Cup. Such a notion may seem ridiculous, but it came far closer to fruition than most people might imagine. The British brought the ‘Gentleman’s Sport’ to Argentina in the early 19th century. The majority of these immigrants were industrialists and major landowners and brought with them all the furnishings of English high society. Alongside banks, railways and even a Harrod’s department store arrived the past-times of soccer, horse racing, polo and cricket. By the 1930’s the British community in Argentina was the largest outside of the Commonwealth. The reason Argentina became fixated with fútbol rather than críquet is a mystery. The argument that it is a sport that mostly appeals to the upper classes does not quite fit, since cricket has proved remarkably popular in some of the poorest parts of India, Pakistan and Sri Lanka. Yet, Maradona’s ‘Hand of God’ aside, the Argentines proved far more proficient with their feet rather than their hands. The first Argentine cricket club was founded in 1831 in Buenos Aires. The national team first competed outside Argentina in 1868, in a match against Uruguay. In 1893 the Argentine team showed incredible commitment, embarking on a three-day crossing of the Andes by mule in order to arrive in time for a game against Chile. Such dedication meant the cricket scene continued to flourish, and in 1913 the Argentine Cricket Association (ACA) was created. In 1927 the national team lost a closely contested series 2-1 to an English touring team called Marylebone Cricket Club (MCC). The MCC, founded in 1787, is regarded as the most famous cricket club in the world and was formerly the worldwide governing body of cricket. Such a narrow loss to the prestigious club highlights the level of competency of the Argentine team at the time. When one takes a closer look at the roster though, the names of the star ‘Argentine’ players of the era, including the Ayling brothers and Herbert Dorning, reveal a heavy British influence. It was the lack of a native contingent of players that would prove to be the sport’s downfall in Argentina. World War II resulted in many of the British residing in Argentina returning to their homeland in order to assist the war effort. Juan Perón’s nationalization of British-owned companies throughout the 1940’s further diminished the Anglo influence and cricket began to fall out of favor. Twenty years later there was a mini resurgence in Argentine cricket and in 1979 the country was represented for the first time in the International Cricket Council’s (ICC) Trophy. This five division system organized by the ICC pits countries outside of the top nine cricketing nations against each other to compete in a series of one-day international tournaments. In the last couple of decades the national team has struggled, plummeting through the divisions during its participation in the World Cricket League. In February 2012, Argentina commenced their campaign for the first time from the depths of Division Five along side other cricketing minnows such as Singapore, Cayman Islands and Bahrain.